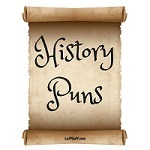 These history puns are historically bad! They're sure to make you groan. Still, that's why we like puns! If someone else had flown first, it just wouldn't have been Wright. Napoleon may not have designed the coat he wore, but he did have a hand in it. The bartender asks, "You mean a martini?" The Roman replies, "If I wanted a double, I'd have asked for one." Which English king invented the fireplace? If you need an Ark, I Noah guy. The problem with studying history is that the teachers just seem to Babylon. Before America was founded, the idea of a democratic nation in the New World was unPresidented. A teacher asks one of their pupils, "Can you describe Napoleon's origin?" When a knight in armor was killed in battle, what sign did they put on this grave? Why were Native Americans in America first? People hated Ho Chi Minh because he was Hanoi-ing. There are many marbleous statues in Greece, but many people take them for granite. Because there were so many knights. Robert E. Lee was voted most likely to Secede in his high school yearbook. King Arthur's army was too tired to fight, because of all the sleepless knights. Last night on Dancing With The Tsars, Peter and Catherine were great but Ivan was terrible. Hitler jokes are rude, Anne Frankly I don't care. What do you call a detective from the Reformation? What was King Arthur's favorite game? During the Great Depression, President Hoover didn't give a dam.